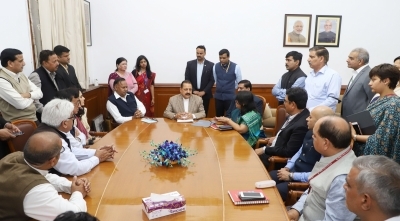 NEW DELHI: Minister of State in the Prime Minister’s Office Jitendra Singh on Friday met members of the IAS Association over the alleged assault on Delhi chief secretary Anshu Prakash by AAP MLAs and assured them that he will put across inputs and suggestions to ensure safety of officials. Singh said it is a part of his obligation to ensure that the officers have a work-friendly environment “so they can put up to the best of their potential, the best of their performance in the larger interest of the nation”. “…have told them that we would put across all these inputs which have been furnished by them,” Singh told media persons after the meeting. He added that during the meeting, the delegation submitted that they strongly condemn the assault on “any government officer by anybody during execution of their duties”. The minister said that a memorandum has been prepared listing some of the grievances of the IAS officers. “…very soon two or three of their representatives would engage in a discussion with the DoPT (Department of Personnel and Training) Secretary to put across various suggestions which they have relating to the guidelines laid down by the DoPT as far as the conduct in the administrative sector is concerned,” he added. “They would discuss the guidelines that should be followed, if they are being followed or not and how an environment can be created where people can constructively work together to take forward the government policies,” he said.